Minestrone Cooking on the Stove, smells gooooood! 1/4 or so of really good olive oil. I buy Henry’s Olive Oil in five gallon buckets and selectively share it with others, but I go through five gallons pretty regularly. Whatever good olive oil you have locally, use that. Heavy, dark and green, not light and clear! 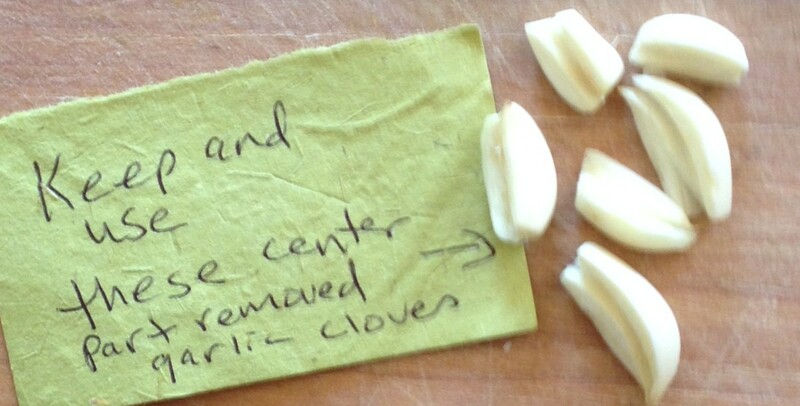 more garlic than you think you need (at least one whole bulb) and prepare it correctly, by removing the centers. See instructions at the end. freshly chopped herbs: oregano, thyme, and parsley. If you have to use dried herbs, use fresher ones, this means not the ones sitting in your cabinets for three years! Buy in the bulk section when you can for dried herbs, the turn over is much greater there, so they are fresher. red wine 1/4 to 1/2 cup (the better the wine, the better the soup, you can drink the rest of the wine with your dinner). If you live in Humboldt County, where I do, you can always check out Bob’s Picks in the wine section at the Northcoast Co-op. He has excellent taste and the wines he picks are often not too pricey and they taste great. two to three cups cooked beans, garbanzo, cannelloni, white, fava, whatever beans you want. I always do garbanzo beans and usually a white or Lima or cannelloni bean as well. I use Westbrae Natural canned beans if I am not cooking the beans from scratch. Parmesan or Asiago cheese or some other nice strong cheese to add as a garnish if you aren’t making this for vegans. If you are doing a vegan version, don’t add the cheese. a bag of cooked noodles (gluten full or gluten free). This is optional. I don’t eat a lot of gluten and don’t like the gluten free stuff too much, so I just enjoy the soup minus noodles. Kids love noodles and if you throw the noodles in to their bowls, not into the soup base, and cover them with all the veggies and soup, this is one way to get them to eat some veggies! Okay, with all those ingredients, surely something magnificent should be the result, and it is. This is actually a very easy soup to make. Just sauté up the onions first for ten minutes with the white pepper or black pepper in the good olive oil, then add chopped carrots and celery, sauté those up for another five to ten minutes. Medium heat for the duration of soup cooking, until the end. Throw in the fresh herbs and the zucchini and the garlic and the first teaspoon or so of good salt. After a few minutes add the wine, and then add the tomato sauce and tomatoes. You can cook this for an hour or more, then add the beans and cook another hour or so. Add the balsamic vinegar when you add the beans, also the cayenne and more salt. You can cook this soup for hours if you want, the veggies get pretty soft though and the beans can break down if you cook it for too long. On the other hand, the flavors blend really well the longer you cook it. This is something you have to discover on your own. I generally plan on this soup taking at least two hours to prepare and cook/simmer. I have let it simmer on low for another hour or two. Do not cook it on medium for more than an hour or two. 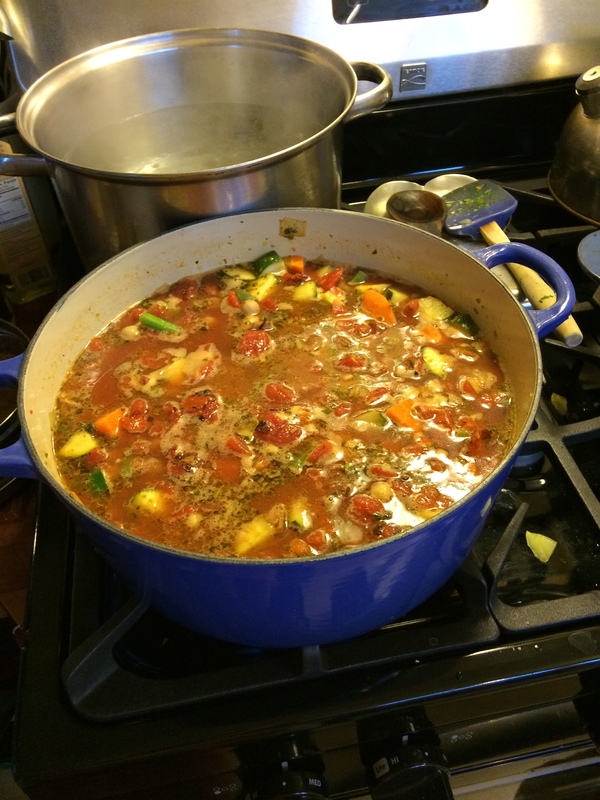 Once the ingredients have all had a chance to hang out together, put it on simmer and do something else. I don’t cover this soup, either, I love the smell it makes and so does everyone who walks in the door! Right before you are ready to eat, if you are making noodles to add to the soup, make sure you have a pot of boiling salted water ready to put the noodles in. Noodles generally only take five to ten minutes, if they are fresher, to cook. Once they are strained and done, toss them lightly with olive oil so they don’t stick. Keep them in a covered bowl or in the original pot you cooked them in, so they stay warm. Another trick with noodles, when you are NOT making macaroni and cheese, is to rinse them with VERY hot water once you strain them. This removes the starch that makes them sticky. I only do this with regular noodles, not with rice or other kinds of pasta, which is more delicate. The only other thing you need with this meal is a green salad and some bread, if you are doing the gluten route. Otherwise, it is a meal in itself. Oh, yeah, don’t forget the glass of good red wine or for those who don’t consume alcohol, just enjoy the soup! Garlic Center Removing Instructions: All centers of garlic bulbs should be removed. They are bitter, older and not healthy to eat. 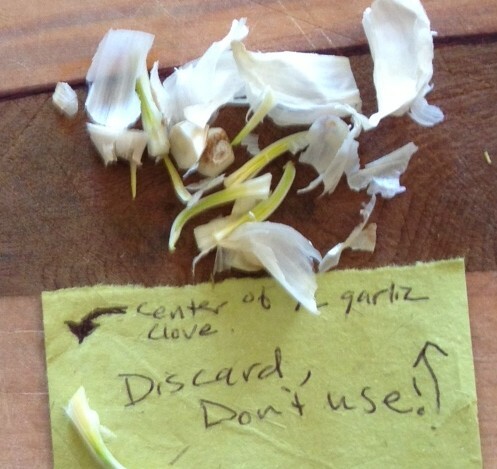 If you take the time to remove the centers from your garlic bulbs, everyone eating your food will be happier. The only time I do not remove the centers of garlic is if I am roasting whole garlic or using very fresh, young garlic that has no visible discoloration or center part. Folks who cannot eat garlic, can and do eat food I cook with garlic and they do not have the same problems they normally do when eating garlic not prepared this way. The centers are the problem! Yummy recipe! My mouth is watering! You are an incredible chef. I hope you have or will post your vegetable couscous. The falvors are divine! Thank you Nicole. Thank you Laura, Seven vegetable cous cous is on here. So is the eggplant dish.